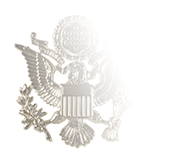 This collar device is sewn onto the wearer’s left collar of the Operational Dress Uniform. To properly position the device before sewing in place, picture a line equilaterally bisecting the collar point that runs from the point to the top of the collar. 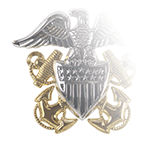 Center the device on the line with the top of the caduceus pointing toward the collar, effectively bisecting the insignia vertically. 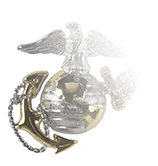 The bottom of the insignia should be 1.5” from the collar point. 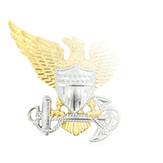 The crossed caduceus and fouled anchor, longtime Corps device for Officers in the United States Public Health Service, underwent a minor redesign as part of an effort to ensure consistency in the Corps' insignia and other accoutrements. The Operational Dress Uniform replaced the Battle Dress Uniform as the Commissioned Corps’ working uniform in 2015. 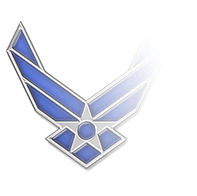 It is worn with the blue T-shirt (replacing the black tee worn with the BDU), with the blue Command Ball Cap serving as its primary cover (eight-point caps and boonies are optional wear items).